Knowing what to do with empty printer ink cartridges can be a challenge when it comes do disposing of them safely. Every year about 350 million cartridges are thrown away improperly. There are several ways to recycle used cartridges, and the five following tips are among the five best methods. Several major printer brands have mailing programs where customers can send empty cartridges back for recycling. However, most brands will only be able to accept their own brands of cartridges. Brands such as HP usually include a pre-paid plastic mailing envelope in the boxes along with new cartridges. However, if a customer has a collection of empty assorted cartridge brands, there are third-party main-in recycling programs who will accept most major brands. Approved mailing envelopes can be obtained at office supply stores or from the post office and used for mailing any empty cartridges. Major office supply retailers, such as Office Depot or Staples, have special bins located at their stores for ink cartridges to be recycled. While these bins may be for a third-party cartridge recycling service, major brands may also have a bin specifically for their items. Similar bins can also be found at other major retailers that also carry printer cartridges. Private office supply sellers may also have a cartridge recycling program available for their customers who may have several different printers used in an office. Concerned office managers can ask their suppliers for details. Empty ink cartridges may seem like an odd thing to donate to a charity, but it can make a difference. Many charities that accept empty cartridges sell them and use the money earned from those sales to give back to those in need. Other charities will donate the profits earned from cartridge sales to a charity specified by the donor. Usually charities that accept empty cartridges also accept other electronic devices for recycling, such as cell phones, pagers and cameras. Several charities like this exist, and interested consumers with empty cartridges can find one that they like. Some companies will buy empty cartridges and pay cash for them. While this idea may not be as helpful as recycling for charity, it is quite helpful to gather a few dollars quickly. Several companies that buy used electronics such as cell phones, cameras and computers will also buy ink cartridges. However, selling empty cartridges is not very lucrative. If one of these companies gives a quote on an empty cartridge will pay UP TO the amount quoted, meaning they may pay less when the actual exchange happens. Those interested should do diligent research before selling cartridges. There are several different ink refill kits available for purchase for refilling empty cartridges. This method, however, is not very popular. 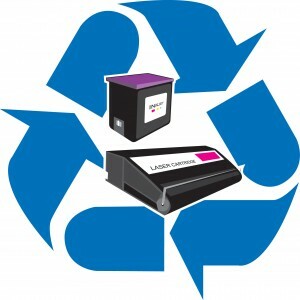 While reusing items guarantees a lower carbon footprint, refilling ink cartridges is quite messy and time consuming. Kits are available for specific printer cartridges or printers, or generic universal kits can be purchased. Print shops can also refill empty cartridges for a fee. Refilling cartridges comes with a caveat – cartridges can only be refilled a few times before they are useless. Unless the printer cartridge being used is rare, customers should look into recycling other ways. Recycling empty ink cartridges isn’t difficult when one knows where to look. Keeping cartridges out of landfills is easy with the abundance of recycling programs and options available. Research potential recycling methods before turning old cartridges over to make sure companies and organizations can accept certain cartridges without any problems.